THAT'S THE ONE WE SKIP! During an inspection visit to the Chané river, in Eastern Bolivia, in January of 1990, a colleague who taught at a South American university engaged me in conversation: "Ponce... What are you doing these days?" I answered that I had recently completed a paper on the Vedernikov number. Acknowledging his ignorance of the subject, he said, "The... what number?" To which he answered, "Yes, of course." I then said, "Well, it is there... in Chow." To which I responded, "In Chapter 8." He then said, "Which one is that?" And I responded, "The one titled 'Theoretical Concepts...'"
Finding himself totally at a loss, he acknowledged with a grin, "Oh, yeah... that's the one we skip!" 1 Chow, V. T. 1959. Open-channel hydraulics. McGraw-Hill, New York; the standard text on the subject. 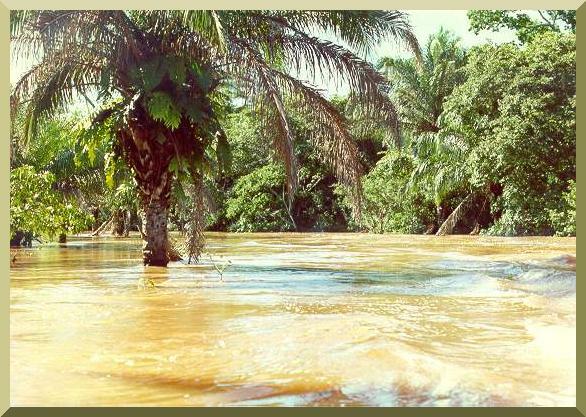 Flood stage on the Chané river, in Santa Cruz department, Eastern Bolivia, January 1990.